As college students we know how important it is to save a buck. For most of the students who live on campus, buying groceries is a weekly cost on top of our bi-annual tuition and room payments. Christina Riendeau, a local “couponer” offers five easy ways to get more bang for your buck by saving money on groceries. Check out the clearance items. Much of the time, items are placed in the clearance pile simply because the company is redesigning the packaging. Items are often priced at 50 percent or more off. Download the Target Cartwheels app. Any time you are going to Target, search for the items you’re buying on your app. It will then show you if there is a coupon for that particular item and what the discount is. Riendeau says; “I’ve seen items go up to 50 percent off.” On top of your cartwheel coupons, you can use manufacturer coupons and Target coupons. Target also will post numbers and codes on Facebook, blogs, and other advertising platforms that you can text to receive a list of coupons. Lastly, once a month Target offers mobile coupons for produce that are for $1 off $1 or more’s worth of fresh fruit and the same for fresh vegetables. Check for the code words. “When you are buying items look for anything that says ‘extra free’ or ‘more free’ on the packaging. You’re paying the same as you would for the regular small item but for a larger quantity,” says Riendeau. Look for items that say “sell by” a date that is within the next few days. Stores have to sell by that date, but the items won’t generally expire for another week or even longer. You can find discounts like these on meat, bakery and dairy products. Always find out if a store accepts manufacturer coupons. The Dollar Tree, Target and Walmart all accept manufacturer coupons. You can often combine manufacturer and store coupons. Just be sure to check with the store. Some great places to look for coupons are coupons.com, the newspaper and coupons.target.com. Also, you can actually send an e-mail to the company of a particular brand asking for coupons and they will often send you coupons via email or mail. Some of the local stores offering the best deals are Harris Teeter, Farm Fresh and Target. At Harris Teeter, they will double the price of your coupons up to $0.99 every single day. (Ex: One $0.99 coupon takes off $1.98). They also offer store coupons called “ZVRs” which are usable with manufacturer coupons. Farm Fresh will also double your coupons every Wednesday for coupons up to $1.00. 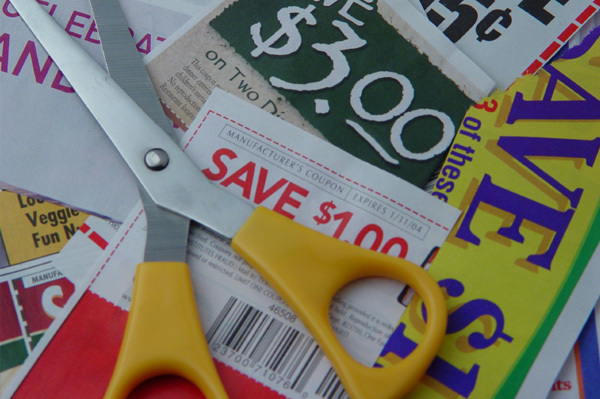 Be sure to always check out the store’s coupon policy to find out how many coupons you’re allowed to use at once and if there is a restriction on how many you can use for each item.